Describing the starting point of the Liviano design, Daniel Schulz, co-owner of the Boos & Schulz Designagentur (BSD) design agency, recalled that a primary objective during the design phase was to get rid of the housing so that the light itself became the lamp. 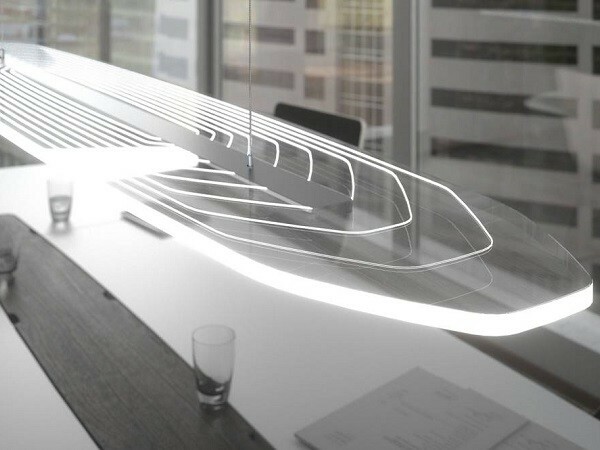 The free floating effect was achieved using the Plexiglas GS lampshade featuring milled lines. The branded acrylic glass transmits light from the LEDs attached to the middle of the plate to the entire unit and couples it with the milled lines and outer edges. Schulz explains that the source of the light fades into the background completely, thanks to Plexiglas’ ability to conduct light. To ensure the most delicate light emission, it is important that the material is milled very precisely. Liviano offers a sensational interplay of lines, which changes depending on the viewer's perspective. Liviano goes beyond its decorative appeal to reveal a whole new utilitarian side: The second source of light of the pendant lamp, a downlight, creates a functional working light. The LEDs take a backseat thanks to a covering made from Plexiglas. The branded product disperses the light evenly across the entire surface of the unit, ensuring homogeneous lighting without hotspots. According to Schulz, the design has a very practical advantage as the light is very pleasant and glare-free for the user, even when working on a computer. Both sources of light can be dimmed independently of one another for optimal lighting. Thanks to the high-quality appearance of Plexiglas, the lamp is both subtle and refined, says Schulz. Customers can choose between the series model and an individual lamp made especially for them. Available in various sizes, the lamp also as a ‘tuneable white’ version, where the light’s colour can be changed from cold white to warm white for everything from functional to cosy lighting. Schulz adds that these versatile features make the elegant Liviano lamp ideal for both office and home applications. Allstar Plastics specialises in fabrication, laser cutting and router cutting of various sheet materials such as Acrylic Perspex Sheets, Plexiglas, Polycarbonate, Aluminium Composite Material (ACM) Alucobond, HDPE and HIPS, Polypropylene, Polystyrene, PETG, PVC, and Engineering and Industrial Plastics.